UNESCO World Heritage Sites in India are the places which are testaments to the glorious and the miserable past of the country. From forts to temples, lakes to hills and cities to towns, there are 36 UNESCO World Heritage Sites in India. One such heritage zone is Champaner-Pavagadh Archaeological Park, which is located at a distance of around 145 km from Ahmedabad. You can spot several monuments dating back to the 8th century and numerous other sites from the Mughal era. So when there is so much to scrutinise and discover, why not plan a trip from Ahmedabad to Champaner-Pavagadh Archaeological Park? Being an archaeological park, Champaner-Pavagadh is a year-round destination for history buffs. However, it is not a wise choice during the summer season unless you love exploring things irrespective of the weather and climatic conditions. As the summers are very hot here, the best time to visit Champaner-Pavagadh is from November until the end of March. By Air: You can take a flight to Vadodara Airport and then from there you can hire a cab to Champaner-Pavagadh. Vadodara Airport is located at a distance of around 42 km from Champaner-Pavagadh Archaeological Park. By Rail: Champaner-Pavagadh is not well connected to major cities via rail. The nearest major railway station is at Vadodara at a distance of around 50 km. By Road: Located at a distance of 145 km from Ahmedabad, Champaner-Pavagadh Archaeological Park is easily accessible by road. However, route 1 is the fastest as it will take half an hour lesser in comparison to route 2. On your way to Champaner-Pavagadh, you can take a break at Vadodara and explore its historical beauty. Vadodara is popular amongst tourists for its historical palaces and gardens. You must take a break at Vadodara if you desire to go back in time and learn about the history of Gujarat and the kingdom of the Gaekwads. The major places of interest in Vadodara include Laxmi Vilas Palace, Hazira Maqbara and Kirti Mandir. You can also enjoy the beauty of its colourful gardens scattered all over the city. Once you have entered the walls of Champaner-Pavagadh Archaeological Park, you will be free to roam around and explore its archaeological sites. This archaeological park is home to several ancient wonders, ranging from the 8th century to the 14th century and from Mughal architecture to the Hindu style, which have been in existence for centuries and are standing strong since their outset. 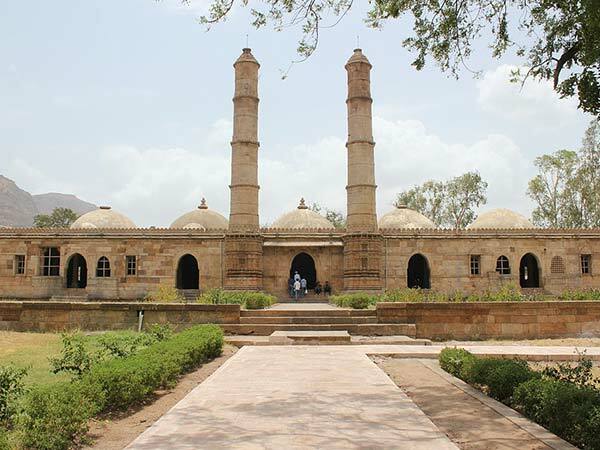 The heritage zone of Champaner-Pavagadh comprises of several stepwells, tanks, mosques, tombs, temples, gates and palaces and is located around the historical city of Champaner, which is surrounded by Pavagadh Hill in the Panchmahal district. The city of Champaner is believed to be built by Sultan Mahmud Begada of Gujarat. Each and every corner of Champaner-Pavagadh is worth exploring. There are generally eleven types of monuments at Champaner-Pavagadh and these buildings are situated on the plains of Champaner and the hills of Pavagadh. Currently, all these historical monuments are under the care of the Archaeological Survey of India. The major reason which makes Champaner-Pavagadh Archaeological Park a must-visit destination for tourists is the architectural beauty and the structural formation of the monuments lying inside its boundaries. On one hand you can find beautifully carved temples and on the other hand, you can spot well-adorned mosques with designs and patterns. Certain prominent structures which you should not miss in this archaeological park include Jami Masjid, Sahar ki Masjid, Kalika Mata Temple, Pavagadh Hill, Citadel Walls, ancient gates at Pavagadh Hill and several other ruined monuments. So, how about planning a trip now?